Mitsuboshi Belting Ltd. fue fundada en 1919 como fabricante de correas industriales y a través de grandes esfuerzos, se ha convertido en una de las empresas líderes en la industria de la correa. Ahora sus productos incluyen impermeabilización frente al agua y plásticos de ingeniería, pero siempre se han adherido al lema, “calidad del producto y vender calidad”, para ganar la confianza de los clientes. Siempre se han mantenido sistemas de control de calidad estrictos, tanto a nivel nacional y extranjero, obteniendo ISO 9001 o ISO / TS 16949, que está considerado como el estándar internacional más exigente para los sistemas de gestión de calidad. Sus principales fábricas nacionales y varias internacionales han sido certificadas por la norma ISO 14001, y se está participando activamente en el desarrollo de productos amigables con el medio ambiente. Con la política de gestión de base, para contribuir en la sociedad mediante el suministro de productos de alto rendimiento, alta precisión y alta calidad, nos esforzamos para un futuro próspero de la sociedad. Our standard rubber and Polyurethane timing belt follow JIS and ISO standards. There are a variety of tooth profiles and size variations, and has a wide product availability. Our timing pulley also follows JIS and ISO standards. Versatile, having a wide inventory line up and excellent product availability. Rubber and Polyurethane timing belts smoothly engage the round tooth shape. It has a variety of tooth pitch and size variations available, versatile and excellent product availability. A round tooth timing belt pulley. This is the standard type of product with inventory in a wide range lineup. Compared to the SUPER TORQUE®, which has excellent transmission ability, the narrow width of the belt and pulley can make for a compact design. High torque type of polyurethane is also available. By using a special cord and rubber compound, it increases the transmission capacity of MEGA TORQUE® G and potential for a compact design product. MEGA TORQUE® GII uses a special tooth profile, which implements high strength and long life. When using carbon cord line, while only metal chain can be used with high torque and under high load conditions, the belt is equipped with the industry’s best transmission capabilities. The belt has a light weight and low noise design. The exclusive pulley is used for the Giga Torque GX special tooth profile. Please contact us for more information. It’s required for precision machinery and the like, that are frequently starting and stopping, it is a belt suitable for conditions where high position accuracy and damping properties are necessary. With use of the MEGA TORQUE® EX Timing pulley with a special tooth shape it, has minimal back lash and implements high positioning accuracy. H Series Timing Belt Timing Belt has high power transmission capacity. This belt can be used as an alternative for chains and gears with its advantages of cost-efficiency, quiet operation, and long operative life. Type: H8M/H14M. Classical V-belt are the most widely used power transmission belts. Economical and easily obtained for replacement. Maxstaer Wedge V-belts have double power transmission capacity of Classical V-belts due to greater wedge effect. It features high speed transmission, energy saving, and compact design. MAXSTAR WEDGE SUPREME is manufactured as a raw edge cogged type. This belt is mainly used for machinery and equipment made overseas. A system that can be easily fitted by installing the axis to the rotating pulley, coupling, gear, sprocket foil, etc. Mounting a spanner to the pulley shaft is simple to install or remove, and because removal is also easy, there is a decrease in man hours. Shaft hole manufacturing is unnecessary. Because the shaft hole corresponds with the standard axle diameter, the key groove manufacturing at the time of use is not required. Narrow V-belts was developed to transmit a higher torque in a small assembly area, which enables space saving, high speed drive, and reduce the cost of operating and maintenance. Oil/ heat resistance and electrical conductivity. The MAXSTAR POWER was developed for heavy duty applications, where high torque transmission is required. Its performing level increased more than 50% compared to the standard specification. The HA and HB type of MAXSTAR POWER is made up of two or more standard V-belts connected together at the top. It was developed to satisfy the special requirements for the agricultural machinery like harvesters and combines. The SUPER KB is mainly used for light duty applications, but has more resistance to heavy shock loads than FHP belts. The special outer covering is suitable for backside idler usage. These belts have high resistance to heat, high humidity, oil, and cracking. The TRIPLEX is suitable for applications with small pulley diameters and provides higher coefficient of friction against the standard wrapped belts. It is widely-used for its cost efficiency, availability, and its simplicity of replacement. This V-belt for agricultural machinery, with a thinner shape compared to industrial V-belts, is designed to withstand harsh use conditions, has excellent heat resistance, flexibility, and crack resistance. A V-belt of the highest grade of agricultural machinery, furthering the Orange Label specifications from above, it uses high elastic/short fiber reinforced rubber that guards around heat resistance, flexibility, and crack resistance. Raw edge cogged belt used with many general agricultural machinery drives. It has excellent heat and crack resistance, suitable for use in small sites of back bending and pulley diameter. The raw edge cogged belt for small and medium size agricultural machinery, in comparison to general Orange Label Cogged V-belt, it further increases heat and crack resistance. Suitable for use in small sites of back bending and pulley diameter. Raw edge cogged belt for large size agricultural machinery, it is particularly great for heavy duty and high horsepower transmission. Within agricultural machinery V-belts it is equipped with very high durability and wear resistance. Has both the V-belt’s high transmission capabilities and a flat belt’s flexibility, it is able to achieve high transmission efficiency. In addition, it is also useful for compact systems and energy saving. High speed rotation is required and widely used in machines and automotive engines. Uses a bushing system you can easily remove and position (Some sizes already are equipped with the shaft hole). With 1 hexagon wrench, you can install, remove and position easily to the axis rotation shaft. If the bushing position is set, because the pulley is automatically fixed, alignment adjustments are also easy. With worldwide use of polyurethane V-belts, it achieves narrow drive pulleys and compact designs. Multi types are available. Mainly used for sewing machines, home appliances, and precision instruments, this is a compact belt for light load transmission with a beautiful translucent exterior. Can be easily welding by heat sealing and can be used in free length layout. Suitable for single or multiple use in simple light loads or conveyance. The flat belt is thin and has excellent flexibility. Because it can use smaller diameter pulleys it can achieve a compact design. In addition, with the uniform thickness of the belt, it reduces vibration and can do high speed rotation with power transmission. Because it is molded with one pliable seamless piece and is very flexible, a small diameter pulley can be used and has a smooth and stable rotation. It demonstrates excellent ability for transmission, paper money and card conveyance, and is widely used for banking terminals, ATM, and ticket vending machines. This belt, being superior in flexibility, is able to use smaller pulleys with high speed rotation. In addition, with the multiple V ribs low cord elasticity and a special rubber, it delivers superior power transmission capabilities. There are grinded belts which form the rib shape by grinding and non-grinded belts which form the rib shape with a mold. Low Friction Loss belt reduces friction loss by minimizing the internal heat generation of the belt rib rubber caused by bending and reduces accessory drive energy loss (engine torque loss). Used mainly by automobiles, recently the trends in the automotive industry include low fuel consumption and fuel efficiency items. To optimize the belt installation with adequate stretch and power transmission with the necessary strength balance, the belt is not necessary for tensioner devices (tension pulley, bracket) that were required for conventional drive systems. By eliminating tensioners, you can save engine room with this light weight system. The side of the belt is a special exposed rubber construction; the rubber is directly exposed to the pulley. Because of this, the belt has high grip power and does not slip, creating high power transmission abilities. Compared to the Raw Edge Plain V-belt, the angle has become larger at 52°. Flexibility and durability are improved by using cogged shape. * Also available is a Multi-ply specification. Has an identical structure as Raw Edge Plain V-belt but the belt base (inner surface) is several sheets of laminated bias fabric, controlling noise from excessive flapping of the pulley. The belt base (inner surface) is a cogged belt, which allows for low energy loss by bending, and adapts to small diameter pulleys. In addition, it also demonstrates stability with high speed rotation. A high torque drive belt with transmission efficiency that is used for automotive cam shaft drives. It has excellent durability, even in the characteristically high temperature environment of the engine room and excellent quietness compared to gear and chain. 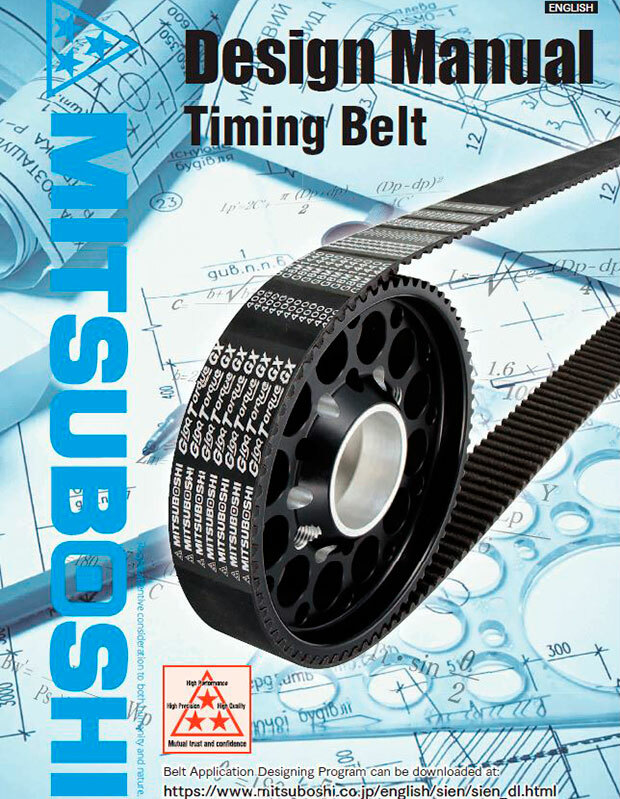 Conventional timing belt’s endurance reliability, oil and heat resistance have greatly improved, a belt that can be used similarly to chain drive system where oil sticks inside the engine block (in the oil environment). Because the guide that is essential to chain drive system is not necessary, the weight of the engine, as well as noise is reduced, and will contribute to reduced fuel consumption which improves friction loss (engine torque). A belt that was developed for rear wheel drive motorcycle. Even under harsh environments with dust and mud, along with exhibiting high transmission ability, in regards to a drive chain, it has superior quietness and is light weight. In addition the oiling maintenance for drive chain is unnecessary. Belt that has excellent flexibility and side thrust force resistance and is used for light duty and continuous variable transmission. As well as improved resistance to deformation due to side thrust force, by providing a cog shape on the back, it is continuous variable transmission belt for heavy duty with excellent flexibility and resistance to side thrust force. In recent years the automotive and general purpose machinery engines have been using metal chain for cam drives. The Timing Belt in Oil was developed to replace the metal chain. We continue to expand to various automotive engines that contribute to light weight and low noise engines and improved fuel consumption. The Timing Belt in Oil, compared to conventional rubber belts, has higher oil and heat resistance and are used inside the engine block (oil environment) where the oil sticks, and up until now rubber belts could not be used. While a guide is necessary for a chain drive, it is unnecessary for Timing Belt in Oil. A guide is no longer needed for oil timing drive system, which makes a light weight and low noise engine. Because it has excellent transmission efficiency compared to metal chains, it contributes significantly to improved fuel efficiency and decreases energy loss. Because it can be used in the same way as a metal chain inside the engine block, without greatly changing the engine layout, it is possible to replace with the belt from the chain. Star Fit® is a V-ribbed belt that interacts with a specific pulley which has no adjustment space. Star Fit® is a belt used in accessory drives which uses low modulus elasticity cord. It is unnecessary to install a tension pulley and bracket, which allows for reduction in engine space and to lower costs. The pulley and bracket weight is about 1.5kg in light weight vehicles, which contributes to improved fuel consumption. By using the special tool, it can be attached between the fixed axis layout while stretching the belt. This lowers costs and reduces space which is achieved by getting rid of the tension pulley and bracket. Can expect improve fuel efficiency due to the weight of the system. Giga Torque GX uses a high hardness and flexible carbon fiber cord, in pursuit of strength and flexibility. We are able to make the belt width compact and the results from saving space, light weight and low noise, is expected to improve the performance of machinery and equipment. Furthermore, this is not limited to timing belt applications, but the scope can also be expanded to chain drive applications. With its high transmission capacity, it will be able to narrow the width in the same conditions as a conventional belt. As a result, it is possible to use a light weight pulley, thereby reducing noise and saving space. Suppressing the elongation of the belt by the carbon cord and improve wear resistance by special processing fabric, it has 1.7-2.2 times more durability compared to conventional high torque timing belt. By using the carbon cord, the initial tension can be set lower due to less tension decay. Also from suppressing the elongation of the belt, it’s possible to prevent pitch gap and greatly improves durability. By using newly developed cover fabric and V core rubber, the SUPER AG-X has rapidly improved wear and crack resistance and has a long life. By using the newly developed cover fabric, wear and slip during times of heavy duty loads reduces the wear caused by friction of the pulley. By using reinforced short fiber rubber, it can drastically reduce the shock from bending, suppressing the load on the cord. SUPER AG-X has 1.3 times the wear resistance of the competitors’ product. With the combination of high strength cord and high elasticity rubber we have 1.5 times the shock resistance of the competitors’ products. Have 1.6 times the durability of other companies. An auto tensioner is a device for maintaining the constant tension necessary for power transmission of accessory drive system with load variation under harsh engine conditions. With using an auto tensioner it controls poor transmission from decline in tension, slip, squeal (noise). Difficult tension management maintenance becomes unnecessary. STARLOCK® is a lock system that offers simple yet secure and strong attachment of shaft and boss without troublesome key groove processing. Thus, it also saves calculation and control processes required for shrink and force fit methods. With this system, shaft and boss are easily put together by high surface pressure.